Good apps like was said earlier it does the job. And not a lot of extraneous files. Just one besides the readme. This tool seems to have problems with multisession CDRs. In case of my experience, it recognized only the first session and omitted the data from the following ones. 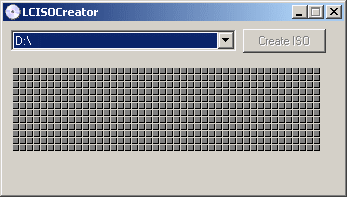 Everything was going well until it aborted and displayed the message "THe parameter is incorrect". This is not a copy protected disc I'm trying to make an ISO of btw. Really good. Does what is intended to. No need to install any crappy driver. Wow, some real compact coding here. This is so far the best iso maker I have found. The only qualm that I have is that it can't ISO protected cd's/dvd's.